Save fifty percent on the animated spy spoof on Blu-ray this week at Amazon! 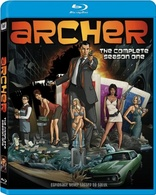 The online retailer is now selling 'Archer: Season One' and 'Archer: Season Two' for $19.99 (50% off suggested retail price). Click here to order Season One and here for Season Two and this offer is available now through January 21.